Thomas Hupp is a man whose life has been dedicated to building a world at peace. Thomas was one of the founders of the Farm – an intentional community in Tennessee created by a group of young people who left San Francisco in a bus caravan hoping to build a better world. Among many other enterprises, they created a book publishing company which became a leading US publisher on vegan and vegetarian cooking and health and wellness. Thomas for many years ran marketing at the book publishing company and traveled the country attending book fairs – always on the look out for solutions to what ails us. During the years he raised a family, adoring kids and grandchildren. I met Thomas when he inspired an attempt to integrate the permaculture effort at the Farm with the Solari model. The result was a financial permaculture conference. The concept flatlined when the leaders decided government grants was what they wanted. However, Thomas and I had bonded and that is when he joined me on my quest to figure out who was really running the planet. As we searched for Mr. Global and noted the endless stream of bailouts and missing money, Thomas decided to write a book about his search and identify the topics and sources that would best inform the seeker of truth about governance: Tracking Mr. 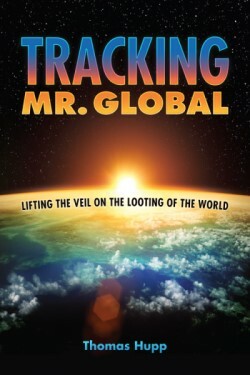 Global: Lifting the Veil on the Looting of the World. If you want to unwind from media disinformation, here is your chance for a condensed Reality 101 course that walks you through all the issues you need to know – and what you can do about it. The bibliography provides an excellent reading list. You can learn more at the Mr. Global website, read the Table of Contents or buy a copy at the Book Publishing Co website here.